There are more than 22 species of mammals and 250 species of birds. Common Langurs and Rhesus Macaque represent the primate group. Carnivores include the Asiatic Jackal, Bengal Fox, Sloth Bear, Ratel, Gray Mongoose, Striped Hyena, Jungle Cat, Leopard and Tiger. The artiodactyls frequently sighted are Wild Pigs, Spotted Deer, Sambar, Chausingha, Nilgai, Chinkara and Gaur. Mammals such as Dhole, the smallIndian Civet, Palm Squirrel and Lesser Bandicoot Rat are seen occasionally. Among the herbivores, Gaur is the only coarse feeder. Sidhbaba: This place is named after the holy temple of sidhbaba(god of Indian worship). This is the most common point from where you can see the tiger near this temple. Shesh Shaiya: This 65 ft horizontally laid idol of lord vishnu is the origin of river Charanganga. The reclining statute of lord vishnu on the seven hooded serpent is the architecture of the past. Board train for Jabalpur from Mumbai CST. Arrive at Jabalpur. After breakfast, proceed to Bedaghat & take a Boat Ride for beautiful Marble Rocks in Narmada River. After visiting Dhuaadhaar Waterfall, we will proceed to our resort in Bandhavgarh & relax. (Our stay is at luxurious resort which gives perfect feel of nature with all amenities including swimming pool). 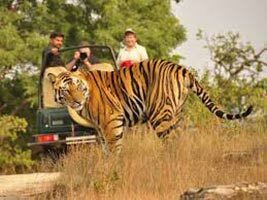 Morning and Evening Jungle safari in Bandhavgarh. Relax in resort, Lunch and departure for Jabalpur, board train for Mumbai. 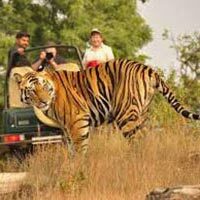 Avoid wearing clothes with fluorescent color at the time of Jungle Safari.